We are based in two buildings at Bangor University; Y Wern & Meirion Building on the Normal Site campus. The buildings are situated on the south bank of the Menai Straits along Holyhead Road, and can be accessed directly from the A55 about half a mile north east of the Telford Suspension Bridge. 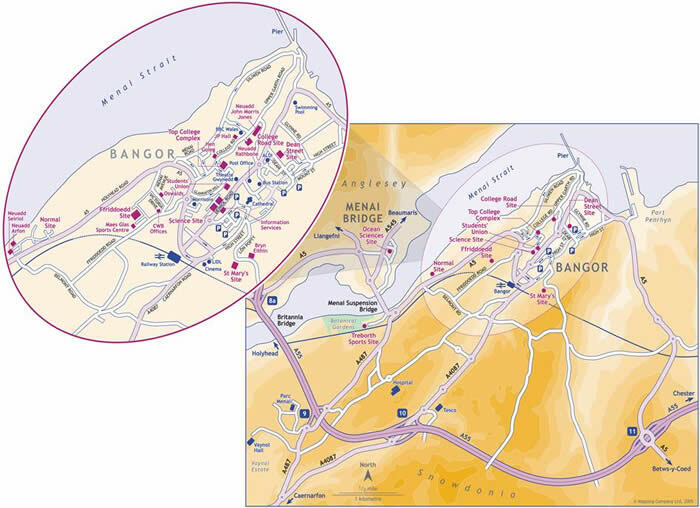 It is also easily accessable by train to Bangor station followed by a 5 minute taxi or bus journey. England – the A55 is the best route. From junction 16 of the M56 follow the A5117, A550 and A494 with signs for North Wales and A55 CONWY. Ireland – ferries from Dublin arrive at Holyhead. Follow A55 to Bangor. Rosslare or Cork ferries operate to Fishguard or Swansea. Then follow the WEST WALES instructions below. South Wales – follow the A470. At Trawsfynydd follow the A487 to Porthmadog, Caernarfon and Bangor. West Wales – from Swansea follow M4 and A48 to Carmarthen then A486 to the A487. From Fishguard follow A487. Near Dolgellau the A470 and A487 combine. At Trawsfynydd follow the A487 to Porthmadog, Caernarfon and Bangor. - from junction 9 of the A55 follow A487 Bangor. At the next roundabout by the suspension bridge follow A5 Bangor. The entrance to the site is on your left ½ mile after the roundabout. Once on the site turn left down the hill, and Y Wern is situated on your left before the Bistro, opposite the main George building, which will be on your right further into the site. Y Wern is signed NWORTH Bangor Trials Unit. The Meirion Building is further down towards the Straits, follow the steep road on the right directly opposite the Bistro, until you come to the last building. Please click here to see a map of Normal Site. We are in buildings 14 and 15.